Discover the quintessence beauty, renown monasteries, historical temples, genuine ethnic handicraft shops in the Bodhnath Stupa strategic area, as well as remote yoga retreat centers in and around the Kathmandu Valley, Nepal. Participate to interesting meetings, lectures and teachings with High Lamas, gNakpas Yogis, musicians, scholars, artists or NGOs development experts. Be truly immersed within the local community ethnic culture while visiting target-sites or institutions with local NGO's staff who are working in Social Work, Tibetan Medicine or High Education. Enjoy renewed friendly encounters with the local Newars, Tamangs, Sherpas, Tibetans and other ethnic groups, residing in situ. Enjoy to be participating to lacal activities in one of the most strategic power-place of the whole Himalayan range, this all within a personally tailor-made itinerary and project. Please do not hesitate to contact us for further information concerning Bodhnath Stupa : Spiritual Re-Awakening Cultural Immersion and/or our Nepal Himalayan Pilgrimages! The option to 14 ~ 21 days in & around Bodhnath Stupa remains always flexible and responding to the participant's main interests and therefore can always be re-united or added to another extra option: Bodhnath Cultural Immersion. Introduction to "Bodhnath Stupa : Spiritual Re-Awakening Cultural Immersion"
All seven tours options we propose will allow you to create your own itinerary, with the help of our local specialists, guides, lecturers and academics. Please take a few minutes to study the Scheduled Itineraries and get an idea of the options on offer. We will then assist you in putting together a discovery programe that will serve your agenda, requirements and approach. Discover the quintessence beauty, renown monasteries, historical temples, genuine ethnic handicraft shops in the Bodhnath Stupa strategic area, as well as remote yoga retreat centers in and around the Kathmandu Valley, Nepal. Participate to interesting meetings, lectures and teachings with High Lamas, gNakpas Yogis, musicians, scholars, artists or NGOs development experts. Be truly immersed within the local community ethnic culture while visiting target-sites or institutions with local NGO's staff who are working in Social Work, Tibetan Medicine or High Education. Enjoy renewed friendly encounters with the local Newars, Tamangs, Sherpas, Tibetans and other ethnic groups, residing in situ. Enjoy to be participating to lacal activities in one of the most strategic power-place of the whole Himalayan range, this all within a personally tailor-made itinerary and project, as presented in our seven tours options! Since 1988, Caer ~Sidi has been organizing Discovery Tours, Field-studies and Stepwise Ethnographic Field Research Program especially designed for practicioners, clinical professionals, researchers, students and scholars. These usually are of a 14 to 21 days duration, but sometimes will enfold upto 4 or 5 months. A longer period will required a special immigration office procedure for either Student, Research, Business or Non-Tourist Visas. These cross-cultural academic exchange aim first to promote more awareness and understanding in both Europe and USA on the current Himalayan region issues. Therefore it may help to ground Euro-Asian expertise on a more genuine database on local community priorities, conditions for local participation, genuine regional history, hermeneutics KABPs and the evolving cultural representation prevailing in the target-site(s). The Himalayan range is indeed another time, another world. Concept of "Bodhnath Stupa : Spiritual Re-Awakening Cultural Immersion"
Should you be alone, or with your family, or a small group of friends or be with spiritual practitioners, do not hesitate to contact us, we will develop a custom-made escorted tour based entirely based upon your personal approach, agenda and request. Accordingly, engaging in your own spiritual practice is highly recommended and completely acceptable. Each individual tour itinerary differs depending on the participant. Such journeys intend to seek genuine remaining traces that would allow to go to the inner roots of Nepal Himalayan Traditions, where Tibetan Buddhism, Shamanism and Hinduism are embedded into one another and therefore are still living beliefs, where the old traditional religions, politics, ethnic-based culture, arts, shamanic healing are blended with new technology, media and education into a revolutionary evolving strikingly refreshing new culture. 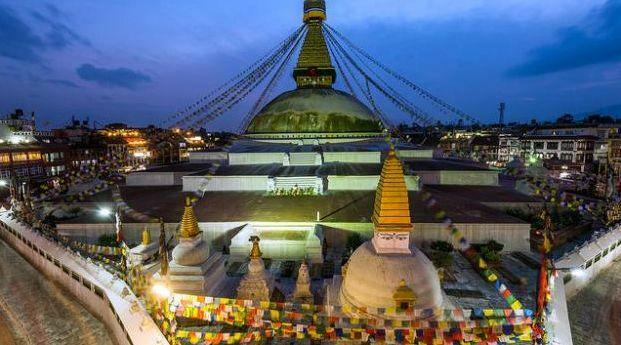 Our journey, as such, always begins at the Bodhnath Stupa, situated a few minutes from the TIA Airport, just north-east of the ring-road surrounding the capital city of Kathmandu. The Bodhnath area will be our main logistics resources, our base-camp and a strategic site for networking assets. We will first meet your local team being guides, translators, supervisors, or facilitators, as per the need of your project. Please, do not hesitate to contact us, we will develop a custom-made escorted tour upon your approach, agenda and request.